William Lucy was an associate of Dr. Martin Luther King, Jr. and is a leader of the Coalition of Black Trade Unionists. The original 1972 founders of Coalition of Black Trade Unionists were William Lucy, Nelson Edwards, Cleveland Robinson, Charles Hayes and William H. Simons. William Lucy, Secretary-Treasurer of American Federation of State, County and Municipal Workers was named as a sponsor of the Communist Party USA dominated National Anti-Imperialist Conference in Solidarity With African Liberation held at Dunbar Vocational High School, Martin Luther King Drive, Chicago, October 19 to 21 1973. 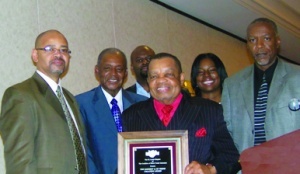 William Lucy, treasurer of AFSCME and president of the Coalition of Black Trade Unionists, was a keynote speaker. Lucy was critical of President Carter's trimming of social services programs and said, "Black folks can't decide who will be President; but they can decide who will not be President. We have to reorganize priorities." William Lucy Sec/Treasurer AFSCME and president of the Coalition of Black Trade Unionists, addressed a "special unity convention session" on day two of the Democratic Socialist Organizing Committee/New American Movement Unity Convention in Detroit March 21/22 1982, that resulted in the formation of Democratic Socialists of America. In 1996 Lucy was a member of Democratic Socialists of America. 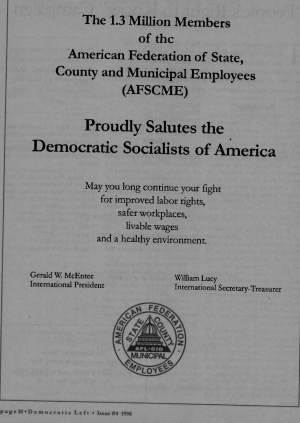 In 1995 William Lucy, secretary-treasurer of the American Federation of State, County and Municipal Employees (AFSCME), AFL-CIO, succeeded to the presidency of Public Services International (PSI), the world’s largest union federation. The 10 million-member PSI, with about 200 affiliates from over 100 nations, is the largest of the International Trade Secretariats (ITS). It is comprised of unions representing public sector workers including, among other U.S. members, SEIU, AFT, CWA and AFGE. Lucy, who had been serving as first vice president of PSI, succeeded PSI President Monika Wulf-Mathies, who resigned after accepting a senior position with the multinational European Union in Brussels. Lucy will fill the remaining three years of Wulf-Mathies’ four-year term. A column by William Lucy appeared on Page 13 of the CPUSA newspaper People's Weekly World [[PWW} in their March 21, 1998 edition. It was entitled "An eight-ton gorilla called MAI" and concerned the Multilateral Agreement on Investment and corporation/financial institutions ability to "buy, sell, locate or move anywhere - without control or regulation by national, state, or local governments." This column appeared on the PWW page entitled "If you ask me . . ." and does not say that this was a reprint of anything Lucy had previously written. He was identified as "secretary-treasurer of the American Federation of State, County and Municipal Employees. In 2006, Bill Lucy, AFSCME, served on the National Advisory Board of the Apollo Alliance. On November 8, 2008 Metro Atlanta Democratic Socialists of America celebrated its second annual Douglass-Debs awards dinner at the IBEW hall. About 200 people were in attendance. William Lucy, AFSCME’s international secretary-treasurer and president of the Coalition of Black Trade Unionists, gave the keynote speech. Lucy stressed the deep significance of Obama’s victory, evoking images from a history that began on slave ships and culminated in a mass movement for change. In discussing the current economic crisis, Lucy recalled Michael Harrington’s The Other America and urged those present to be strong advocates on behalf of the poor and homeless. In his conclusion, he emphasized the importance of mobilizing and pressing congress to pass the Employee Free Choice Act and enact universal health care. Coordinated by the embassy, TransAfrica Forum and CBTU, events in Washington DC and 17 cities around the United States celebrated Nelson Mandela’s 95th birthday on Thursday, July 18 with members of the original anti-apartheid and Free South Africa Movement, special guests and performances. April 7, 2014, (Metropolitan Washington Council, AFL-CIO)DCNA’s Sandy Falwell joined Rev. Rodney Sadler, Rep. Keith Ellison, and Amanda Lugg and other activists at the U.S. Capitol last Friday to connect Dr. Martin Luther King, Jr.’s fight for economic justice with a tax on Wall Street to fund efforts to reverse inequality. "The Inclusive Prosperity Act would make Dr. King proud," said Rep. Keith Ellison at a kick off press conference in Washington against the backdrop of the U.S. Capitol. "This is a holy day, a sacred day," Ellison continued. April 4 is a day America remembers Dr. Martin Luther King, Jr. It was on this day 46 years ago that he was assassinated, slain while in Memphis to provide support to city sanitation workers as part of a campaign for worker justice and to fight poverty. And on this day in 2014 Rep. Ellison spoke of the Robin Hood Tax, embodied in his bill, H.R. 1579, a sales tax on Wall Street speculative trading that would create hundreds of billions of dollars a year in revenue for communities in need, a way to attain the economic equality Dr. King was seeking. In Washington, William Lucy, president emeritus of the Coalition of Black Trade Unionists, who was with King in April, 1968, stood today outside the Capitol with Ellison remembering King and calling for passage of the Ellison Bill. "The Inclusive Prosperity Act really is a vehicle to continue the work of Martin Luther King, Jr.," said Lucy. "The sanitation workers of Memphis wanted decency and dignity," he remembered. "Keith Ellison wants economic fairness. I applaud him." After 35 years at the helm, longtime labor leader and social justice activist Lew Moye stepped down as president of the St. Louis Chapter of the Coalition of Black Trade Unionists, effective Nov. 1 2014. CWA Local 6355’s Mark Esters, vice president of the St. Louis Chapter, will assume the leadership role. Moye and St. Marks Family Church, which has served as a safe haven and central meeting place during the unrest in Ferguson, were honored Oct. 18 at CBTU’s 28th Annual Ernst and De Verne Calloway Awards banquet. Moye is known in the St. Louis region and nationally for his progressive activism in the labor movement and the African American community. This page was last modified on 11 December 2014, at 05:15.